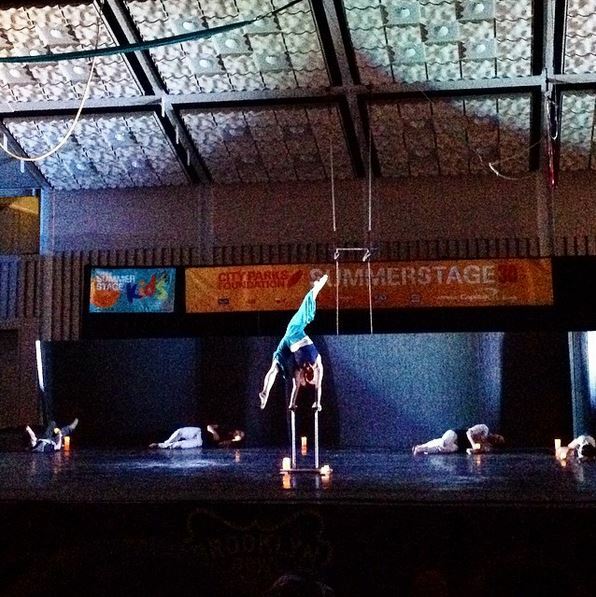 It was such an honor to be invited to perform our evening-length ensemble show Tinder & Ash on August 15 and 16 in Harlem’s Marcus Garvey Park this month as part of City Parks Foundation’s SummerStage Kids International Contemporary Circus Festival. I loved being able to share our show for FREE with audiences who might never see contemporary circus otherwise. Before that, I performed in Dixon Place‘s HOT! Festival for the fourth summer in a row on August 1, sharing the stage with members of Tangle in an evening titled “In a Moment.” It was a wonderful opportunity to share a new solo trapeze act (the first I’ve made since 2011) tentatively titled “Etude for Right Hand.” My work has just begun on this piece, and I’m so looking forward to continuing to develop it.